Virgilio Tojetti's painting “The Sultan’s Dream” is currently displayed over one of the couches at Churchill Bar. An architectural and historical wonder that turned 125 years old last year, The Brown Palace, which just completed an $11 million renovation, is one of America’s great classic hotels. When it was built in 1892, it was Denver’s tallest building, contained one of the world’s first atriums, and was among the nation’s first fireproof buildings. Half a dozen U.S. presidents have stayed here, along with the Beatles and numerous foreign royalty, while Jane Fonda and Robert Redford filmed a movie in the hotel. The Brown Palace is adorned with art and antiques, and in the Palace Arms, the hotel’s fine-dining restaurant, the wallpaper depicting scenes of American history is the same custom print Jaqueline Kennedy chose for the White House. 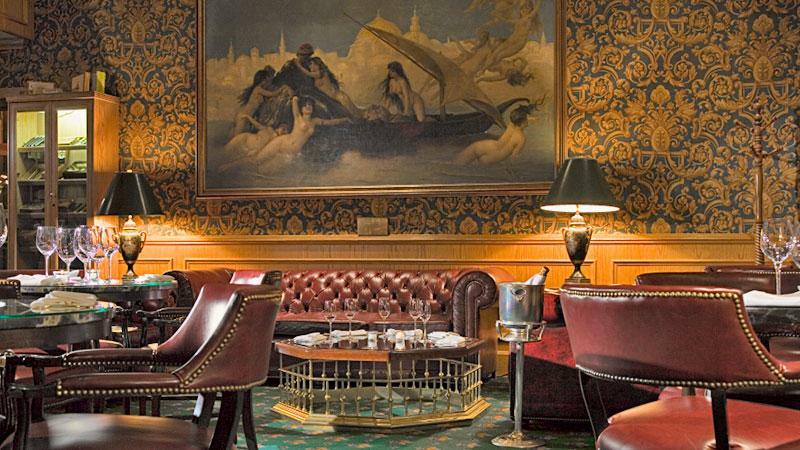 But most importantly, The Brown Palace’s Churchill Bar is grandfathered for smoking, making it one of Denver’s premier full-service cigar bars, complete with extensive food and beverage service. It is known as Colorado’s “Little Capital” because so many state legislators and officials come here after sessions. The bar occupies a street-level corner of the grand hotel that once served as the main entrance in the horse-drawn days before automobiles. The feel of the Churchill Bar is old school—classic, elegant and masculine—akin to bars in the Ritz Paris or Savoy London. The space is furnished with dark leather chairs, sofas with brass nailhead trim and includes a full bar of dark wood with uniformed staff. A huge painting, “The Sultan’s Dream,” by Virgilio Tojetti, was commissioned by the hotel for its opening and is currently displayed over one of the couches here. The humidor is large and built into one of the walls, with numerous private lockers for members (membership is currently sold out), and the centerpiece artifact is a cowboy hat in a glass case behind one of the couches. It belonged to the late Mr. Boyce, an original member who came in and sat on the same couch every day since Churchill opened the cigar club in 1996. The cigar list is thoroughly described by body, wrapper, filler and ring gauge, and is divided by size, from cigarillo to petit corona, figurado, corona, robusto and, of course, Churchill. Robusto is the largest category with a dozen choices, including standards such as Avo XO Legato and less common options like the La Aroma de Cuba Mi Amor Reserva Romantico. All together there are nearly 30 choices from such brands as Macanudo, Ashton, Arturo Fuente, H. Upmann, Rocky Patel, Cohiba and Romeo y Julieta. Following the extensive hotel renovations, the Churchill Bar revamped its menu for 2018, which includes small plate bar snacks like sliders and meatballs, as well as access to the lunch and dinner menus from two of the other hotel-dining venues. The whiskey-centric bottle collection also includes lots of Ports, sherries and fine wines and spirits, with a focus on rare and one-of-a-kind bottles. In many cases, if a spirit is allocated anywhere in Colorado, it is here. Offerings include a full range of Orphan Barrel Bourbons, seven labels of The Macallan, including 25-year-old, Ireland’s Green and Yellow Spot whiskies, and collectible Cognacs such as Richard Hennessey and Rémy Martin Louis XIII. Craft cocktails are served with a third in the glass and the rest in a small decanter set in a bowl of ice so they never get warm. Smoking is only allowed in this bar, so it is a popular spot before and especially after dinner at the Palace Arms, as well as many other downtown dining spots. Denver has one of the most revitalized downtown areas in the country, full of hip dining venues, and The Brown Palace sits in the middle of it, within walking distance of Coor’s Field, home of the Colorado Rockies, and close to both the Pepsi Center (Colorado Avalanche) and Mile High Stadium (Denver Broncos). The hotel occasionally hosts special events such as whiskey pairing dinners followed by a cigar visit to the bar. Open every day from 11 a.m. to 11 p.m.